William Penn, the architect of the Philadelphia province, was extremely disillusioned with the crowded cityscapes he found in so many European cities during the 17th century. Therefore, when he served as the primary designer of the new province in 1681, he made certain that the streets were wider and that the living plots offered ample room for both a home and garden. Penn’s vision for the “city of brotherly love” was one in which the structure of the city itself supported healthy interactions between all members of the society. Even though great Philadelphia office spaces are not cities, their spatial layouts are equally important to the productive cohabitation of the company’s team. An efficient office space is one in which every employee’s needs are met, whether they need to individually focus or collaborate with their colleagues. 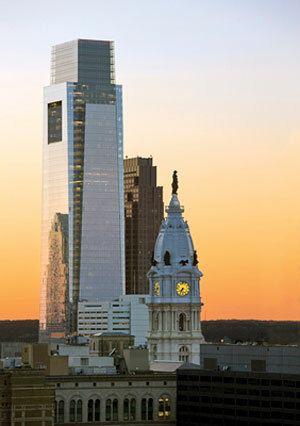 Among the most recognized Philadelphia Office Buildings is the Comcast Center, the HQ of cable industry giant Comcast. It’s 58 story, 1.25 million square feet glass covered structure was completed in 2008. Comcast occupies over 85% of the building for its own use. Janet Pogue of Gensler–a global design and architecture firm–admits that while employees must have space to focus individually, they “…can do that without being boxed in on every side.” Heeding Pogue’s advice, businesses of all sizes are banishing cubicles in exchange for defined quiet rooms that are stocked with all of the tools, from pens and paper to WiFi, so that contemplative work may be effectively completed. Other areas, on the other hand, must be purposefully designed to promote interaction between employees. Whether this is a welcoming staff lounge stocked with snacks or a comfortable seating section that supports meaningful dialogue, these communal areas provide the foundation for the communications that will not only unite the team, but that will also benefit the team’s productivity. Just as Penn purposefully designed Philadelphia’s layout to fit every occasion, business owners and managers must also remember to purposefully engineer unique spaces to fit the multitude of needs within their businesses. Please contact us today to discover how the perfect Philadelphia office space will transfer the brotherly love from the streets into the office for unparalleled productivity. This entry was posted in Office Space, Office Space Design, Office Space Market information, Philadelphia Office Space on June 22, 2014 by Jim Osgood.